Search engines quickly acknowledge fresh and unique text, images and video content that are added to your website and blogs. Companies are increasingly using blogs to increase brand awareness. Do you need help in creating new content for your corporate blog? Are you facing problems handling the comment moderation for your blogs? aMarketForce can help you overcome these issues. aMarketForce’s blogging services support clients in asserting their company brand and online presence. Blogging is an efficient way of gathering prospects and customer feedback, steering the direction of discussion and increasing SEO effectiveness. 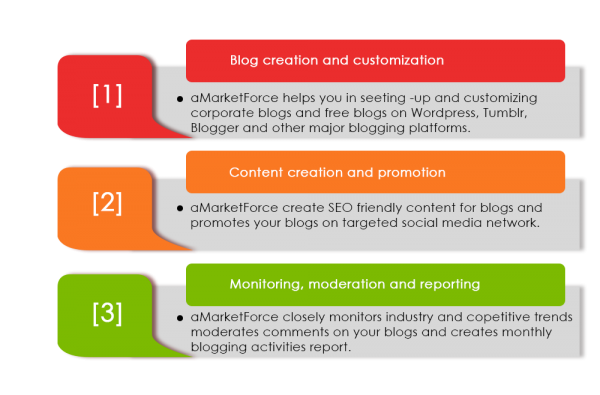 aMarketForce’s blogging team analyzes the content promotion and blogging practices followed by our clients’ competitors and designs an efficient and measurable blogging strategy. We help our clients create and customize corporate and free blogs on WordPress, Tumblr, Blogger and other major blogging platforms. aMarketForce then helps clients in creating SEO-friendly content for blogs and articles. These blogs are actively promoted on online social networks and communities. Comments by blog readers are moderated by our blogging team. 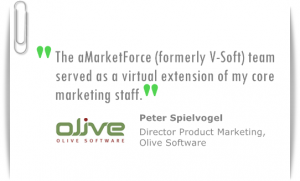 aMarketForce closely monitors industry and competitive trends and generates a monthly blog activities report. Contact us to learn more about our corporate blog management services and other digital marketing services. Request a Quote for social blogging services.